Growth of sea creatures and algae has slowed, which implies declining ocean carbon uptake. This seems to be an unanticipated, indirect impact of fishing, which is an important new insight. Where have the fish gone? Farley Mowat's 1984 work, Sea of Slaughter, shows the immense strength of the fish-powered carbon sink, before it was damaged by fishing and whaling. Fish lift nutrients to the surface water, fertilizing algae and powering a natural carbon sink. But our massive removal of fish, sea birds and marine mammals over centuries has sabotaged this carbon sink, like deforesting the land. If sea animals made a comeback, the fish-powered carbon sink would mitigate atmospheric carbon dioxide. But this idea - that fish boost ocean carbon uptake, and that science has overlooked it - challenges accepted ideas and threatens the fishing industry. HOW MUCH DAMAGE HAS HUMAN FISHING DONE TO THE OCEAN? We thought we could fish forever, because the sea was a limitless protein mine. Atlantic Canada provides what might be the clearest evidence anywhere of the ecosystem-effects of persistent human fishing. The early 1990's crash of the once great Canadian cod stock is held up as a global cautionary tale against fisheries mismanagement, against greedy human 'overfishing.' But less well known is that the story is not that simple, that, at the level of scientific detail, so much has gone severely and unexpectedly wrong in Atlantic Canada...that the most basic assumptions underlying the 'science of overfishing/sustainable fishing' must now be questioned. Zooplankton were unexpectedly and inexplicably lost along with Canadian fish stocks. If, as seems likely, this is part of the ecosystem impact of fishing, then this finding has global significance. Begun in 1999, this website chronicles my observations, the evolution of my ideas about what is happening to ocean life, and my attempts to draw attention to politically undesirable information about changes in the natural world. "Inconvenient Truth" about sea life? Besides the flattened belly profile, the cod starving in the wild (top photo) shows an unusually downturned head and reddened mouth as it appears to struggle to survive by bottom feeding at a size when it would normally rely largely on prey fish in the water column. This physical sign that adult cod are now struggling to survive by bottom feeding contradicts several current lines of thinking about the reasons for poor growth in cod today (e.g. cooler water depresses appetite, fish are genetically slower growing, excess seal predation is killing them...). A simple shortage of their normal prey appears to be the most immediate problem facing Atlantic cod. And cod are not suffering from excessive seal predation. Check out the mysterious cod kill in Newfoundland, April 2003. The focus on feeding habits also helps to explain why Atlantic haddock stocks (naturally more oriented toward bottom feeding) are faring somewhat better than cod stocks today. An inventory of Atlantic Canadian fish stocks reveals the widespread nature of this trend. Standard views of the workings of the marine ecosystem do not predict, or explain, many of today's worrisome trends in marine life - from the failure of NW Atlantic cod stocks to rebound under a 10 year fishing moratorium, to the global increase in 'harmful algae blooms.' Although multiple factors undoubtedly affect the ecosystem, an overall decline in nutrient cycling or total "productivity" has not generally been considered to be one of them. This is because marine productivity has been thought to be "physically forced." Recognition of the strength of "biological forcing" has been lacking in traditional views, and this is the basis of the arguments offered here, including the reasoning that total productivity can be reduced by significant living biomass removal (fishing). It is speculated here that, besides ecological functions such as floating spawn, one important route of biological forcing that has been missed may be the possibility that vertically migrating zooplankton not only shuttle carbon down to deeper waters, but they may also shuttle 'new' nitrogen up to surface waters. Seal Disease Update - October 23, 2006 Responses from government. "The problems we have today will not be solved by thinking the way we thought when we created them." 2005: Stop the Canadian harp seal hunt! The slaughter of seals only starves fish, and the massive waste, tons of seal corpses left to rot, kills bottom life, including the endangered cod. As the size and abundance of commercially targeted fish species has plunged in recent decades, populations of smaller, unexploited organisms, the 'foundation' species of the marine ecosystem, have also experienced major downshifts. Oceanic zooplankton is in decline, and NASA/NOAA has recently reported an apparent global declining trend in marine phytoplankton production. Evidence suggesting lowered marine nutrient cycling can also be seen along clean oceanic shorelines. 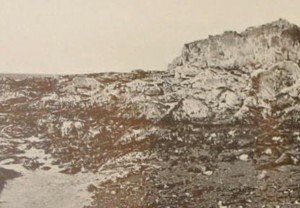 Example: A clean, rocky intertidal zone in Atlantic Canada was heavily dominated by barnacles (filter feeding animals) in summer, 1948, reflecting relatively high marine productivity at that time. (Photo from Stephenson and Stephenson 1954 J. Ecol. 42:14-70 ) Move mouse over photo to see this site in summer, 2002. Now dominated by rockweed with relatively sparse barnacle cover, with individual barnacles very small, this shift away from dominance by filter feeders, and towards dominance by seaweeds, offers classic evidence of a decline in "nitrogen loading" rates. (Carpenter and Capone, Nitrogen in the Marine Environment (Acad. Press, NY, 1983)) This pattern of shifting dominance from filter feeders to seaweed is also widely evident today in the tropics where mass coral bleaching and infectious coral epidemics signal the failing health of those once dominant filter feeders. Update on seals and cod - November 2010 - dramatic DFO evidence of fish stock rebuilding in the presence of record high grey seal density in Nova Scotia contradicts popular hypothesis that seals are "preventing cod recovery"
Videos explaining the basis of my theory that depleting the sea of fish slowed ocean carbon uptake. A positive meeting with the Minister of Fisheries and Oceans ...in which he promises to pry open the door at BIO. May 10, 2004. Ocean Health, Ocean Science, falter together Mar. 9/04 A letter to the Minister of Fisheries and Oceans, requesting an open dialogue. Where have the fish gone? A fresh look at the Ocean - slides and notes from an invited lecture given at Dalhousie University, Sept. 19/03. My most recent attempt to sum up the major thesis of this website. 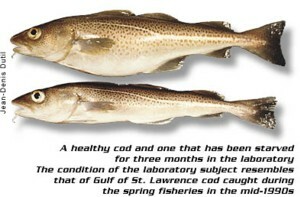 Mysterious cod deaths in Newfoundland - is this due to freezing, starvation or suffocation? April 7/03. Predictable consequences of a zooplankton decline are the increasing starvation of cod, their concentration in inshore locations, and their vulnerability to hypoxic bottom water that can result from an un-moderated 'natural' phytoplankton bloom. Shifting baseline of color in Irish moss Mar. 22/03 Seaweed descriptions in the older literature suggest that bleaching of Irish moss was much less common in the nineteenth century than it is today. Thinking "outside the box" - Feb. 6/03 A letter to the Minister of Fisheries describing why, besides striking an urgent task force to study the ongoing loss of cod, DFO Science must consider the role of "biological forcing" in marine production. Seals and Cod - Dec. 5/02 - Interactions with seals have unexpected positive effects on the growth of cod. Vertical Migration of Zooplankton - does this behavior pattern enhance new production?